The Museum of London tells the ever-changing story of the city and its population, from 450,000 BC to the present day. Its galleries, exhibitions, displays and activities seek to inspire a passion for London and provide a sense of the vibrancy that makes the city unique. The museum is open daily and free for all guests. The organization currently has two locations: the Museum of London based at London Wall, which is due to relocate to West Smithfield, Farringdon in 2022, and a newer site at Museum of London Docklands, London Wall. Despite a high visitor rate of more than one million people, the museum wanted to raise awareness of its overall offer as it faces challenges with the London Wall location, where the building isn’t easily visible to the public. Additionally, it wanted to demonstrate how its communications programs have attracted more people to both locations, and determine the popularity of individual exhibitions. “The communications team primarily works with two of the museum’s wider business objectives: to reach more people and to become better known,” said Laura Bates, PR Manager at the Museum of London. 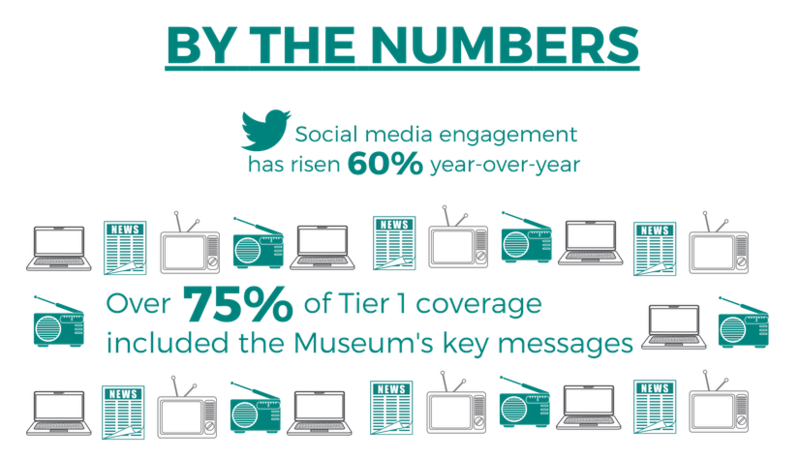 The museum partnered with Cision to develop a measurement framework that could align communications activities to these objectives. The measurements needed to identify the impact of the museums’ exhibitions and overall profile within mainstream and social media. It also needed to shed light on public awareness and interest in the museum’s expansion plans and how all of these factors affected overall visitor numbers. Cision recommended using an omnibus study, which it developed alongside Opinion Matters, a local market research company. The survey asked 10,000 UK residents questions about lifestyle preferences, attitudinal statements, purchasing intents and media consumption habits. This research was combined with media content analysis to paint a full picture of how successfully the museum’s target audience could be reached via media coverage. The survey also identified publications that the museum should be pitching. Once collected and analyzed, survey insights were fed back into media planning efforts in order to improve reach and awareness. The Cision team broke down further implementation into the following steps. Mainstream and social media content was sourced from English-language outlets. Content discussing the Museum of London was coded using human analysts to identify delivery of quantitative and qualitative metrics. These included the company’s key messages, exhibitions and topics. 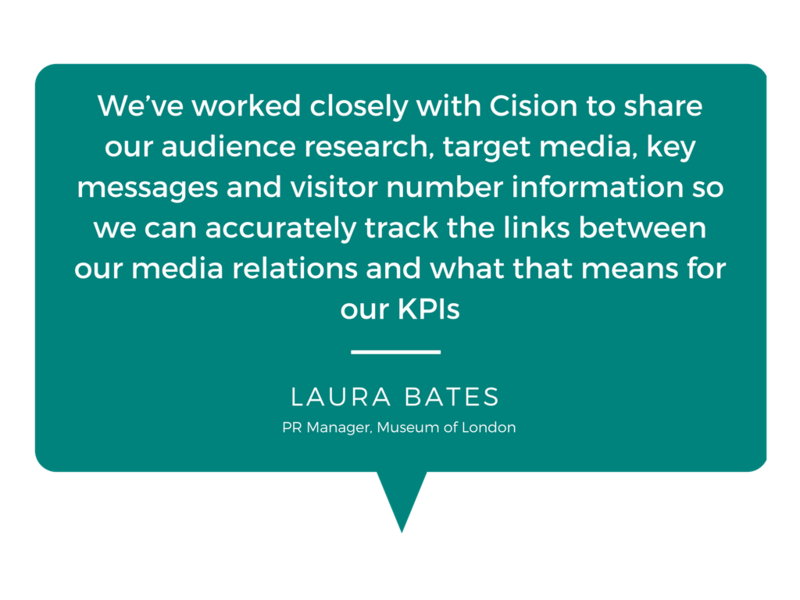 Real-time access to all traditional media analysis via Cision’s analysis tool, AnalysisPro, enabled the Museum of London to engage and react to the analysis flexibly and fast. Cision’s account team worked collaboratively with the Museum of London team to build custom dashboards as required. Monthly mainstream summaries provided an overview of insights from analysed coverage. “These summaries enabled us to monitor the impact of mainstream coverage on more than a quarterly basis and gave us ample time to identify any changes we might want to make to our communications activities before the quarter would end,” Bates explained. These deep dive reports featured a more in-depth analysis of trends, KPI achievement, emerging themes and recommendations for the Museum of London based on findings throughout the quarter for both mainstream and social coverage. The Museum of London provided Cision with visitor numbers to both sites, which were incorporated into the quarterly report, with visitor numbers plotted against both mainstream and social media coverage achieved during the quarter. Publication dates of the Museum’s news releases and any exhibition-specific advertising campaigns was also shown on this chart, with the purpose of identifying potential trends between coverage achieved and the Museum’s communications activity. A social media overview was also featured in the report, including key statistics on content sources, hashtags and influencers. To add further qualitative and quantitative data into the mix, Cision implemented surveys on behalf of the museum to assess public awareness of each location. “These awareness surveys about our impending move directly affect the ongoing communications work towards the move and will actively shape our strategy,” Bates added. Over the course of the campaign, social media engagement rose 60 percent year-over-year. “We are now able to use media intelligence to better target our audience, tweak messaging in forthcoming announcements based on previous message cut through, compare stats year on year to draw comparisons and directly link visitor spikes to boosted media coverage,” said Bates. In terms of mainstream media coverage, 12 tier one publications featured the museum, and over 75 percent of that coverage featured the museum’s key messages. Furthermore, the survey reports have presented the communications team with opportunities for future targeting. For instance, there was a significant gap between how aware young adults were of the museum’s relocation plans from the Barbican and how supportive they were of the move. These findings highlighted the importance of raising awareness of the relocation to generate more support among that demographic. Cision Intelligence provides human analysis and reporting backed by our proprietary tools and leading content sources. Cision Intelligence helps brand identify influence, craft campaigns and attribute value in a way that maps to a communications team’s workflow.